The cast of ‘Hamilton’ performs onstage during the 70th Annual Tony Awards at The Beacon Theatre on June 12, 2016 in New York City. News Americas, NEW YORK, NY, Mon. June 13, 2016: Nine of 16 is not that bad, right? 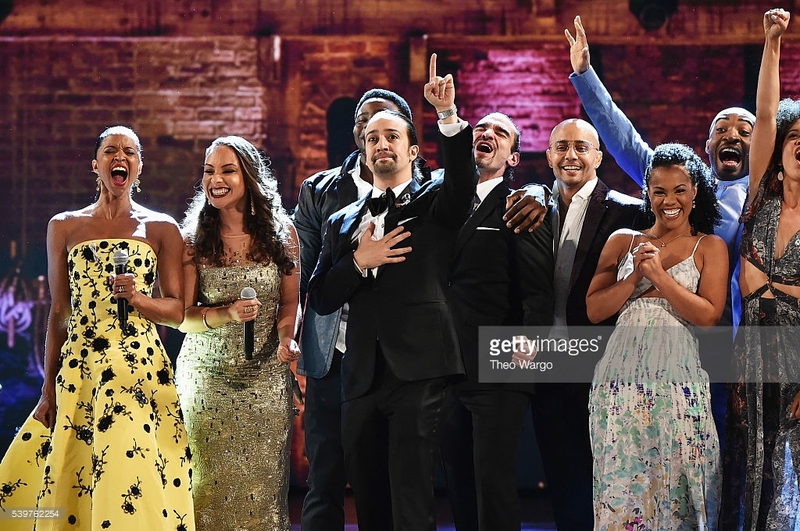 The historic musical created on the life and death of Caribbean-immigrant born U.S. Secretary of the Treasury, Alexander Hamilton, on Sunday night grabbed 9 out of the 16 awards it was nominated for at the 70th Tony Awards at the Beacon Theater in NYC. Puerto-Rico roots actor, writer and composer, Lin-Manuel Miranda, grabbed two awards including for Best Original Score and Best Book of a Musical. The other awards went to Leslie Odom Jr. for Best Lead Actor in a Musical; Renée Elise Goldsberry for Best Featured Actress in a Musical; Daveed Diggs for Best Featured Actor in a Musical; Andy Blankenbuehler, for Best Choreography; Alex Lacamoire for Best Orchestrations; Thomas Kail for Best Direction of a Musical and Paul Tazewell for Best Costume Design of a Musical. The cast also thrilled audiences in the Beacon Theater and those watching at home and online to a small portion of the magic from the show that lucky ticket holders have gotten to see.